When I hear the word pavilion, I automatically think of Disney World where there were these huge canopied structures that did not contain anything until Mickey Mouse, et al arrived on the scene to do a song and dance routine. For some of you, you might think of The Cynthia Woods Mitchell Pavilion where concerts, dance performances and other activities are held. For architects, pavilions are just (usually) small structures that are flexible in use and (usually) temporary in longevity. They have been traditionally used to perform small-scale studies in design, engineering or programmatic layering. They allowed designers a space to do the work they were interested in doing rather than the office building and retail spaces they were compelled to do in order to keep their shops open. Pavilions have been where the magic happens and many of those lessons were then translated into larger scale projects. 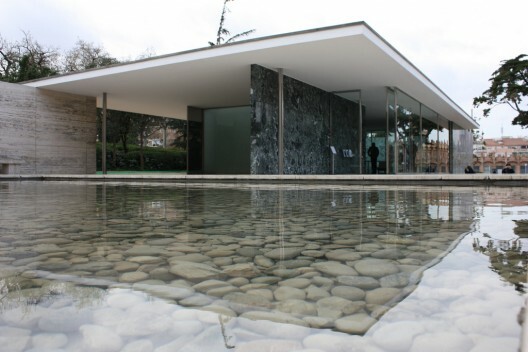 Example: Mies van der Rohe’s Barcelona Pavilion (above) which was used for the International Exposition in 1929. This floating modernist structure in the midst of Art Nouveau was a small-scale experiment of what was to become the leading style of architecture in the 20th century – Modernism. In fact, in the image above, you can see that many structures built today are still influenced by this small structure whose design elements include immense glass, simple geometric forms and a deliberate balance between exterior and interior space. Of course I made this trip to architectural Mecca in 2010 with JB. I get it – but she’s really angry about it. 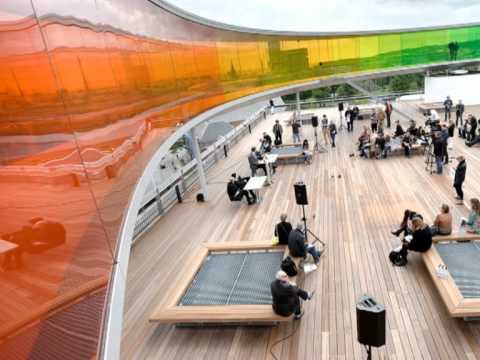 Although I agree that artists and designers should have “a room of one’s own” in order to create the experimental works that inform and influence other pieces, the rise of the contemporary pavilion has done a lot of good things for architecture. What Lavin has forgotten is that architecture is a silent art form. Something that everyone utilizes but few people really think about until it isn’t functioning the way it should. The popularity of the pavilion has caused people to think about architecture. Number one: Pavilions contain the element of surprise. They are usually somewhere unexpected and often contain elements that are unusual. They remind folks that architecture and design can occur everywhere and that whimsy can be valuable in a structure, not just an added cost. They can be enjoyable and architecture could use some of that. Number two: They are not here forever. The fact that they are usually temporary in nature causes people to have a reason to visit a location. This can be very important if a municipality, for example, is trying to encourage people to attend a community event or during the holidays when retailers need temporary store fronts. Like a special feature, people like to be involved in experiences that are fleeting. I want to share some examples of interesting pavilions – some endorsed by Lavin, others endorsed by me. First up, Kate Spade’s Igloo at Bryant Park. So, I have a Kate Spade sweet tooth, ’tis true, but to Lavin’s critique, this prime spot on the ice rink at Bryant Park (right smack dab in Midtown Manhattan) could have probably seen a more innovative structure. It looks like a pop-up tent. Lavin tells us that creative, decorative, disposable structures dilute the possibility for more imaginative and experimental structures and in this case I agree with her. Dear Kate Spade design team – please keep in mind that imagination does not equal paint everything pink and slap a bow on it! I mean, really? An igloo? Too cheesy for me. 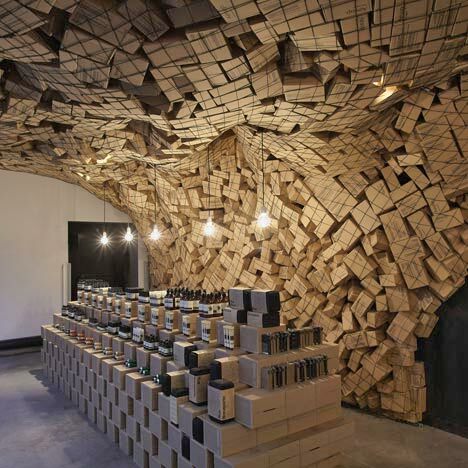 Next up, Aesop at Merci (Paris). So here is an example of a gorgeous interior whose look is architectural but misses a vital component of architecture — the floating cardboard box structure doesn’t serve any real purpose. This is an example where architecture is simply art. Again, another way that Lavin suggests that architects do themselves a disservice. They underplay their technical proficiencies for the sake of decoration. Here is Jorge Pardo’s Flower Glasshouse. I like this one — it’s a re-articulation of the greenhouse. Although Lavin believes this is just an aesthetic creation, I think that this space redirects our understanding of space with its circular form and irregular roof. Now, the best example of a Lavin-approved pavilion! Musclepower at The Land (Thailand). This project is so incredible that I am going to copy text written on this from eyeteeth.blogspot.com. In front of them is a structure made of still-inert plastic leaves holding a 20-tonne concrete counterweight, hanging vertically like clothes in a European miners’ locker room. Their job: to lift them patiently, one by one, using a system of cables and pulleys, moving with animal slowness. Thus muscular energy (2,000 w/h) is transferred, stored and released, transformed, by means of a dynamo, into electrical energy. This endless cycle from elephant to structure to gravity and then to energy compresses or frees interior space, in rhythm with the occupation of the Land and the movement of the counterweight platform. How truly amazing is that? There is an experimental and functional purpose to this pavilion. Innovation that could change architectural design for third world countries. To Lavin’s point, when designers use small, constrained spaces to solve problems, they can then use those experiences in order to develop larger projects that impact more people. So perhaps not exactly fair to go from Kate Spade to a rice village, but that is the point of Lavin’s article. The purpose and form of the pavilion has changed so radically that it’s ability to provide mini-laboratories of design has all but disappeared. And if there are not small spaces where architects can develop new solutions to programs, where can they? My last example, which is a point of departure between Lavin and myself, is the work of Olafur Eliasson (featured image of this post). I love his work so much because he creates structures (inside and outside of existing buildings) and uses basic science to transform a space, like “Your Rainbow Panorama” included here. 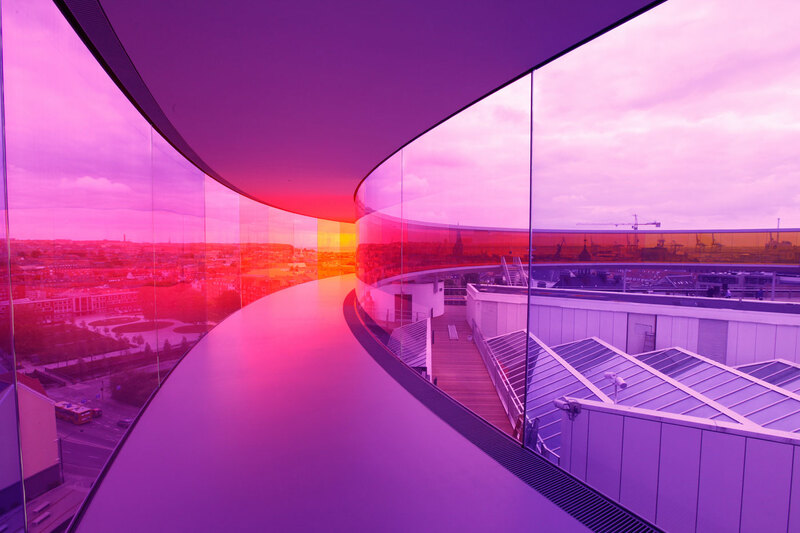 This is a circular pavilion overlooking a city in Denmark whose color continuum change the way you view the vista.